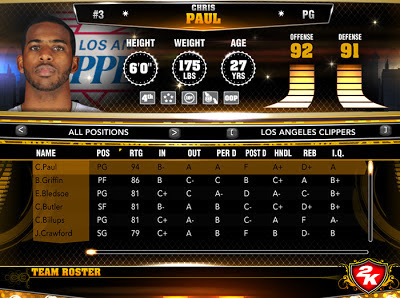 Description: New roster update is now available to download for NBA 2K13 on Xbox 360, PlayStation 3 and PC. It seems like 2K Sports has barely changed anything in this update. There are no additional files in the online data, and Alvin Gentry remains as the head coach of the Phoenix Suns instead of Lindsey Hunter. In addition, 2K Sports still haven't fixed the incorrect lineup of the Bobcats, Cavs, Hawks, Knicks, Magic and Raptors. All the changes made in the roster included in this update are listed below. Please feel free to leave your comments, suggestions, and rants by submitting a comment to this post. Extract the files and copy the “Online Data” and “Saves” folder in to your NBA 2K13 Roaming folder. To find your NBA 2K13 roaming folder, open “Run” and type %Appdata% then open 2K Sports > NBA 2K13 folder. Watch the video tutorial below to learn more about installing the roster and online data files on PC. To use: Open NBA 2K13 menu > "Options" > "Load / Save" > "Load" > Load Roster.